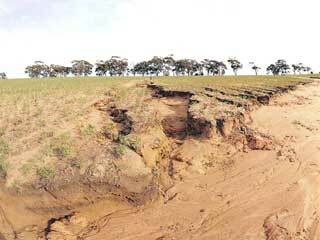 The many forms of soil erosion are listed below. Wind, water and gravity drive erosion. 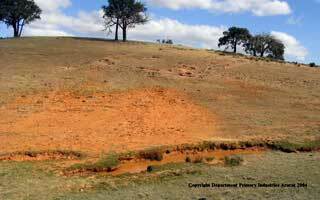 A paper titled 'Agrometeorology in relation to the control of soil erosion' was presented at the World Meterology Conference in Melbourne in 1966 that outlines the mechanisms of both wind and water erosion. 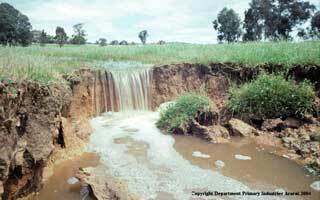 Further information on soil erosion is available on the soil health pages of VRO. Gully erosion results when flows of water concentrating in lower parts of the landscape scour sharp sided entrenched channels deeper than 0.5 metre. More information is available at the gully erosion page. Sheet and rill erosion is the shallow stripping of surface soils by the action of raindrops, shallow flows of water or wind. Rills are included as scour channels up to a depth of 0.5 metre. They are gullies if deeper than this. More information is available on the sheet and rill erosion page. Tunnel erosion is the scouring of routes through susceptible subsoils as flows of water moving through the soil concentrates in cracks, root channels and animal burrows. More information is available at the tunnel erosion page. 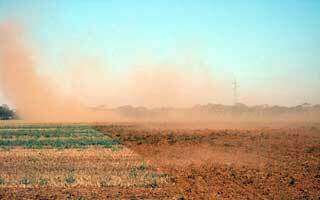 Wind erosion occurs where wind detaches and removes soil components by having direct access to bare dry soil surfaces. More information is available at the wind erosion page. Coastal erosion is a particular form of wind erosion. 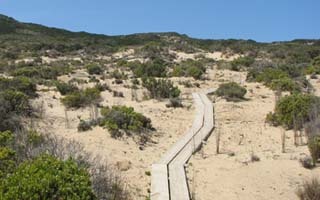 Sand particles are detached and moved by wind where damage to coastal vegetation exposes the fragile sand dunes to the direct forces of the wind. 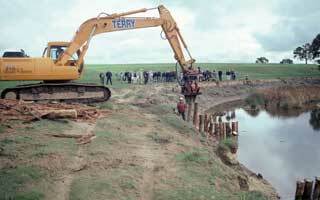 More information is available at the coastal erosion page. 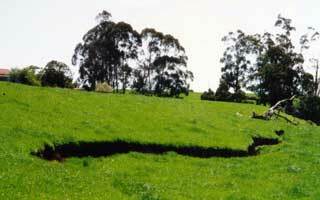 A Land slip is where soil on sloping land become physically unstable and slips downhill. More information is available at the land slip page. Stream bank erosion occurs when streams begin cutting deeper and wider channels as a consequence of increased peak flows or the removal of local protective vegetation. More information is available at the stream bank erosion page.